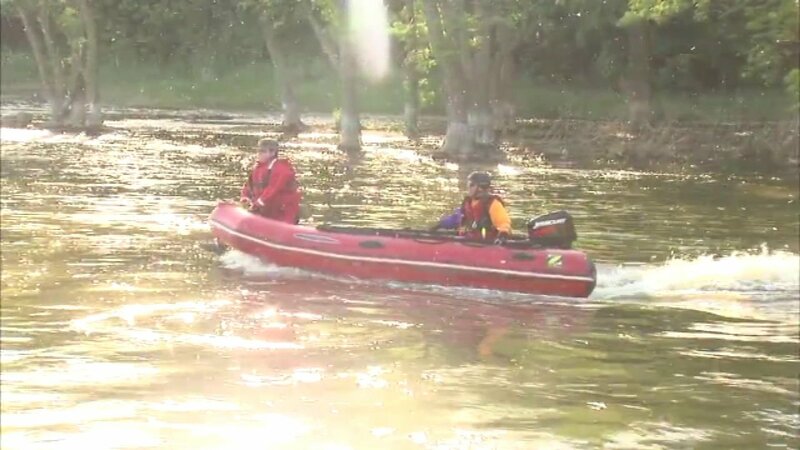 ALGONQUIN, Ill. (WLS) -- Authorities in northwest suburban Algonquin resumed their search Friday morning for a man who jumped into the Fox River after allegedly refusing to pay his restaurant tab. Police responded around 9:20 p.m. to a report of a theft at Nero's Restaurant at 300 Eastgate Court. Police then received information about a man who ran from the restaurant after not paying his bill and jumped into the river. A fisherman saw the man jumped into the water near Route 62 and North River Road, officials from the Algonquin-Lake in the Hills Fire Protection District said. Dive teams searched the river until around midnight, but did not find the man. The search continued around 7:15 a.m. Friday. The investigation is ongoing. Police have not identified the man.